Grand Hotel finishes this weekend with performances April 11-14 at the Palm Canyon Theatre in Palm Springs. 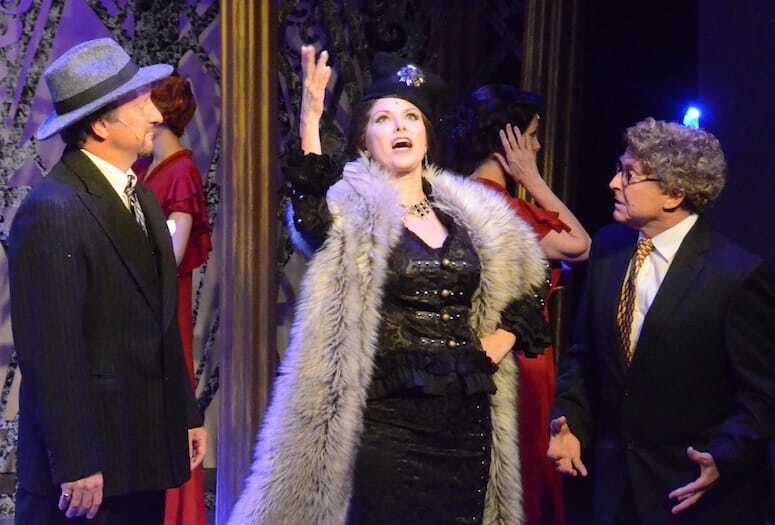 The original source material of the musical Grand Hotel, now playing at the Palm Canyon Theatre through April 14, 2019, was a 1929 novel, Menschen im Hotel (People at a Hotel), by Austrian writer Vicki Baum. Following the premiere of a German stage version, the novel found its way to MGM, where it became one of the world’s first all-star blockbusters, starring Greta Garbo, Joan Crawford, and not one but two Barrymores. The fictitious “Grand” hotel is based on Berlin’s Hotel Adlon, which is located on the famed Unter den Linden around the corner from the Brandenburg Gate. (For you Michael Jackson fans, it’s also the location of the infamous baby dangling incident of 2002.) The musical incarnation premiered on Broadway in 1989 and won five Tony Awards. Palm Canyon Theatre’s lavish production is, frankly, fantastic. 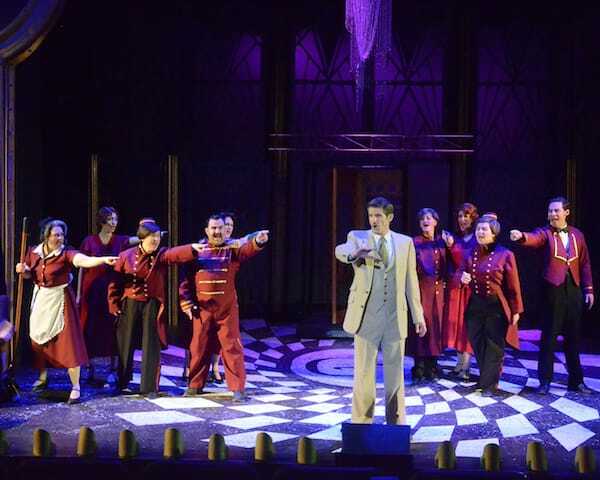 From the actors to the set to the choreography and costumes, Grand Hotel delivers in every way. The large cast is top notch. As Otto Kringelein, a bookkeeper whose days are numbered, Terry Huber hits all the right notes. His Otto is sympathetic but not sappy, and you genuinely feel for him. Another standout is Allegra Angelo, a triple threat who plays Flaemmchen, a typist who dreams of making her way to Hollywood. The role of Raffaela, personal assistant to the insecure ballerina, Grushinskaya, seems to have been expanded from the film, which is great news as it gives the wonderful Adina Lawson plenty to sink her teeth into. Ben Reece deftly portrays Baron Felix Von Gaigern, a down-on-his-luck sort who can’t seem to catch a break. Other highlights include Jacob Samples as Erik, the front desk clerk; Donald Kelley as Preysing; Sam Schwartz as the chauffeur; and Sean Timothy Brown as Jimmy (who shares a great musical number with Flaemmchen). The choreography by Se Layne (who wonderfully inhabits the role of Grushinskaya) is energetic, vibrant, and a whole lot of fun, and manages to work in actual moves from the period, like the Charleston. The set is simple but effective; the hotel’s lobby is our main location with cleverly used set pieces that come on and off the stage to take us to different rooms in the hotel. It’s all very seamless and thoughtfully done. The staging, expertly orchestrated by director Richard Marlow, is terrific. There is always something going on at Grand Hotel, and Marlow keeps the action moving. Meanwhile, Derik Shopinski’s costumes beautifully evoke the late-1920s; from the bellboy’s outfits to various glamorous gowns worn by hotel’s female guests, it seems no detail was overlooked. This is a first-rate production that can be summed up in one word: grand. 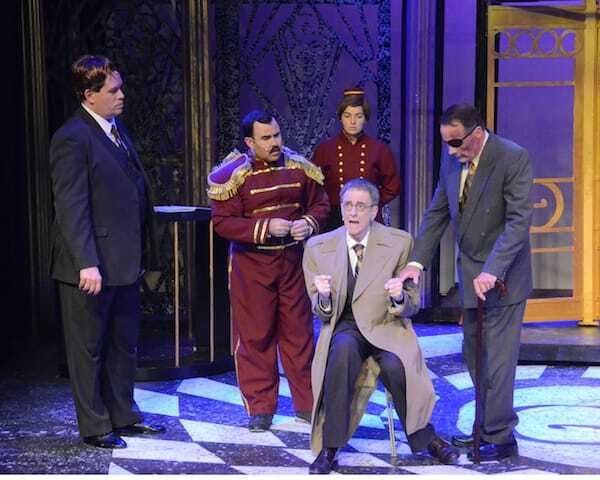 Grand Hotel runs through April 14. For more information or to purchase tickets, call 760-323-5123 or visit palmcanyontheatre.org.